Wow, what a beautiful city. Vancouver is built on a peninsula between the Burrard Inlet and English Bay. Our hotel is on Denman Street in the West End, a block from Stanley Park and running almost North-South with water at each end – idyllic. Across the Inlet is North Vancouver with its three mountains, Cypress, Grouse Mountain and Mount Seymour, they are covered in forest and look fantastic against the clear blue skies. After arriving around midday on Friday and finding our way to our hotel we had a late lunch and dropped into Safeway to stock up on some provisions for our self-catering stay. Nothing complicated, just some pasta for dinner, cereal and bread for breakfast, and milk for tea, we have a tea pot – the first one I have seen since I left home!! We also tracked down the liquor store (no alcohol in the supermarket) and bought some wine and beer, we have got a huge fridge, got to put something in it. We also did some laundry, just like being at home, it’s good to keep in practice. Saturday was Vancouver half marathon (The Sea-Wheeze) and most of the streets around us were closed; traffic was a nightmare so we decided maybe it wasn’t the best day for a bus ride; we put that off for 24 hours and instead took a walk into the park and across to the coast at Second Beach then south to English Bay. Stanley Park is a natural park, not landscaped, it is heavily wooded with tall fir trees and bounded on three sides by water. The beaches on the West side are sandy and sheltered and very popular with swimmers and sunbathers. We whiled away the day exploring the neighbourhood and enjoying some of the Olympic coverage on Canadian TV. Sunday morning, we caught up with the ‘Hop-on-Hop-of’ bus and took the hour and a half loop up through Stanley Park; the route took us passed the rowing club and the yacht club on the waterside, through the rose garden around the north tip with a view out to the Lions Gate Bridge (which looks like the younger sister of the Golden Gate Bridge in San Francisco) then down the west side of the park to English Bay where we had walked. We then travelled across the city to Canada Place, a fairly new development which houses the Vancouver Convention Centre and the cruise ship terminal where we will embark for Alaska later this week. As you can see from the pictures the convention centre has a huge green roof, it looks brilliant from a distance. We hopped-off at Canada Place and walked to The Lookout, a tall building with a viewing deck at the top, the views were spectacular and the display boards explained the history and development of the city – very interesting. We found a restaurant back on the waterfront and had a really nice lunch (prawn and scallop risotto for me, bangers and mash for Mark) watching the sea planes come and go from the Harbour Airport. They are all small planes carrying maybe 8 passengers but there is a steady stream of them taking off and landing, it is quite a sight. By the time we had finished lunch it was time for the two cruise ships at the terminal to depart so we stayed to watch, it was great to see them manoeuvre around each other and to see some of the seaplanes whiz between them to land. Finally, we walked back along the seawall path to our hotel pausing to watch a seal in the marina – this really is a beautiful place. On Tuesday we wanted to go across to North Vancouver to track down my old school, and the house we Majors lived in in 1970 – see the separate post on that. We discovered that the 246 Highland bus went from the end of Denman St just near the hotel and stopped outside Canyon Heights School, it couldn’t have been easier. When we came back the same bus stopped back at Canada Place, just where we needed to be to pick up the City Loop of the tour bus. The City tour wasn’t as good as the Stanley Park tour, it took us passed the football and ice hockey stadiums and a very impressive library, then through Chinatown, Gastown (the oldest part of the city and very similar to Pioneer Square in Seattle – all café’s, bars and restaurants) and back to Canada Place. The route took in quite a lot of nondescript city and some huge construction sites – really not the best that Vancouver has to offer. After the tour we decided to walk back along the seawall (no seals this time) to our bolt hole, we picked up a meatloaf for dinner and spent the evening with our feet up. 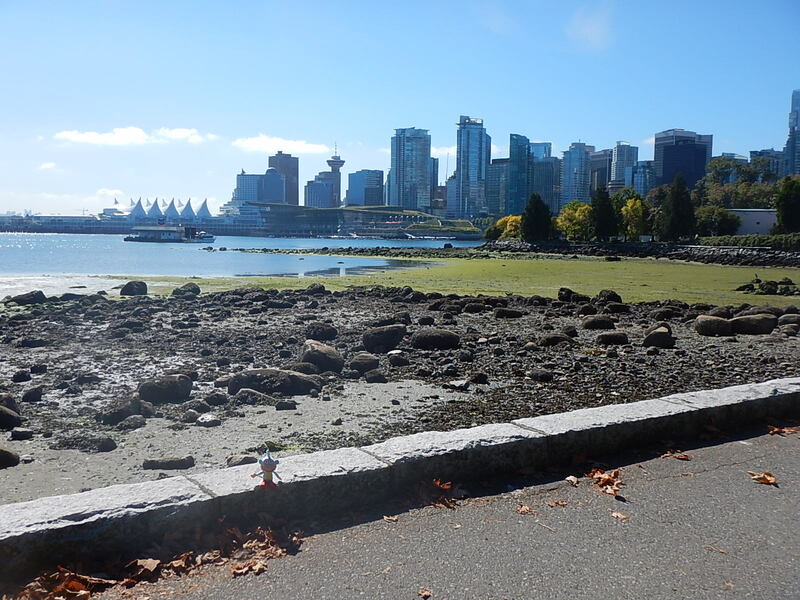 Wednesday, our last day in Vancouver, we decided we had to join the throng of cyclists riding along the seawall cycle path and all through Stanley Park. We hired two bikes and cycled right around the perimeter of the park, it was great fun and a lovely way to see the views across to the North Shore and out over English Bay. We stopped to look at the totem poles that Vancouver is famous for, and which Mark and I both remembered from previous visits many years ago. Back at the hotel we were just in time to enjoy a Skype video call with Mark, Maria, Mia and Max in Spain. It was lovely to see them. Mia has set us a challenge to spot five Whales while we are on our Alaskan Cruise – we will do our best. She and Max are plotting our travels on a map but apparently they are not convinced we are actually travelling, they want to see more photos of us in the different places, and Mark has suggested we include daily newspapers as proof of time and place. I am quite impressed that they think we are clever enough to sustain such an elaborate hoax, never the less we will try harder. Tomorrow we will board the Island Princess and set sail for Alaska, internet access will be limited/non-existent, so our next post will be from Mt Denali in Alaska, now where did we pack our raincoats and fleeces…? I need a kids drier for dogs! Add to spec for Cornwall!